And I don’t only mean your own email signature, I mean the email signatures of all of your employees as well, especially if you’re sending out a lot of customer service related emails. First things first, you’ve got to make sure that there are standard pieces of information your employees include when they’re representing your business. Name, company name, address and phone number. Twitter and Facebook links and encourage people to follow you. 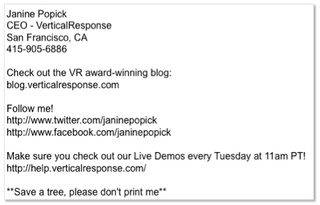 There are also some creative ways you can utilize the email signature portion of your emails that might not be “necessary” but could be fun to add as well as help increase your sales! A “deal of the week” with a special link so you can track how it’s doing. A link to “join your email newsletter” and receive special email-only offers. A customer testimonial so that your recipients can see how much your customers love you. A link to a webinar or an event you want to attend. So don’t let your email signatures be an afterthought. If you’re going to have a weekly deal, make sure you follow through and change your deal weekly. People might actually look for it! Side note: Our social media manager found WiseStamp that inserts your information PLUS latest Tweets, eBay items and any other social media outlet you want people to see.